Another week, another farewell party. One of the teachers from Fuji school requested a transfer to a branch near Kyoto. As with other teacher farewells, we got a gang of teachers and students and went out in Fuji for some (many) drinks and some (lots) or karaoke. The party got particularly lively. I learned that drunk people should really not attempt to use the karaoke machine remote. It’s very easy to type in the wrong number, and the “cancel song” button looks very similar to the “backspace” button. Canceling a song that someone is singing is bad form! I also learned that the average karaoke room table is not a good place to stand, especially when it is covered in spilled beer. Fortunately nobody was hurt during the sudden fall to the floor, although some additional beer got spilled. Another observation was that karaoke places do not have enough bathrooms when you really need one. Some of the teachers decided to take out their frustration by throwing around toilet paper rolls that were awkwardly stored outside the very slow bathroom. This is fun, but not a great way to behave in public. Discussing politics while drunk is NEVER a good idea. It’s an especially bad idea with a group of people from different countries where words like “conservative” and “socialist” have different meanings. Fortunately karaoke was very loud, and it helped cover up the pointless political debate. After cleaning up as much of our mess as possible, the teachers ended up at the nearby convenience store to get some snacks for the train ride home. I found a selection of heat and serve burgers in the baked goods section of the convenience store, which for some reason I found hilarious. When I say hilarious, I mean I literally felt that this burger, in a wrapper that said “burger” in both English and Japanese, was the funniest thing I had ever seen. I couldn’t stop laughing. As funny as I found the burger, my brain was still sober enough to realize that it probably wouldn’t be very good. After making an impassioned 5 minute sales pitch, I finally did convince another teacher to buy the burger. I expected it to be terrible, which would have been funny (for me). He told me it was one of the best burgers that he had ever eaten, and wouldn’t offer a bite so I could taste it. This turned out to be funny for him. Like a previous trip to Fuji, we ended up taking the late train home. There are going to be a lot of sore people in the morning. (2015 Update) I still don’t know why I found that burger to be so funny, and I never worked up the courage to eat an convenience store reheatable burger. My coworker Angie had her farewell party tonight. 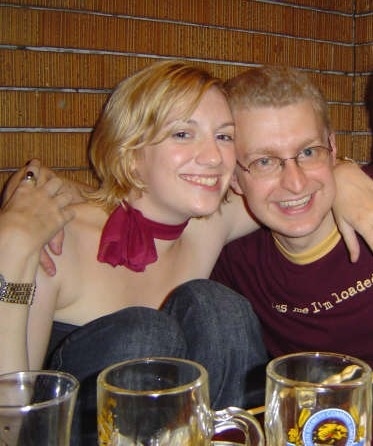 She was finished teaching in Japan, and ready to return to Scotland. Everyone loved Angie; she was a lot of fun to work with and to spend time with outside the office. When I left Japan suddenly to visit my sick sister in Canada, I wasn’t sure that I was going to make it back in time for Angie’s farewell party. I am proud to report that despite starting my day off in Canada, I managed to make it to the party! I started my day in Winnipeg at 5:30am on September 2 (7:30pm Japan time). My flight left Winnipeg at 7:00am (9:00pm Japan time) and arrived in Vancouver at 8:10am (just after midnight September 3 in Japan). After a few hours of waiting in Vancouver airport, I was back in the air and bound for Tokyo Narita airport. My flight was smooth and uneventful, unlike the flight to Vancouver a few weeks ago. I landed at 3:30pm Japan time and proceeded to the lines for immigration and customs. My magical gaijin card allowed me to pass through the resident line, which is always much shorter than the foreigner line. From Narita airport, I took the Narita express to Tokyo station, the shinkansen to Mishima, and Tokaido line to Numazu. With memories of pulling my giant suitcase fresh in my mind, I decided to treat myself to a taxi from the station to my apartment. For those who are unfamiliar with Japan, addresses are really only meaningful to mail carriers. If you are going to take a taxi, be prepared to give landmark directions. I told my taxi driver to drive towards Seiyu, turn left at the lights, and my apartment was across from 7-11 in a yellow building. The taxi driver complimented me on my Japanese and tried to engage me in a conversation, which was a bit beyond my skill level. At least I got home quickly. Once I got home, I started to get a second wind. I had a quick shower to wash off the now 24+ hours of travel, pounded back an energy drink, and then rode my bicycle to Numazu station. For the second time today I boarded Tokaido line, this time towards Mishima. From the station it was a short walk to the izakaya where Angie’s party was already in full swing. I arrived at the party, 9085km from where I started my day, and received a hero’s welcome. Angie was particularly happy to see me, and Koalako had saved a seat and made sure that my drink order was attended to quickly. Fun fact: I was wearing a new t-shirt that said “kiss me I’m loaded” across it. This both started a fun debate on whether loaded meant “drunk” or “rich”, and also got me several kisses, mostly from women. 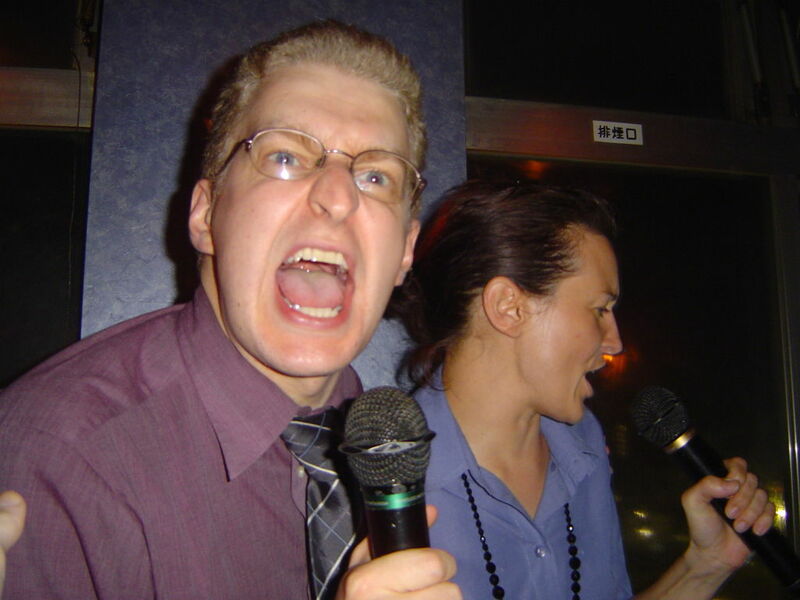 Like most farewell parties, the second party was at a nearby karaoke room with more drinks. Karaoke lasted until the last train came around, and I got a big hug from Angie before we left. I was exhausted by the end of the evening, but happy that I was able to make it to the party. I am going to miss Angie!